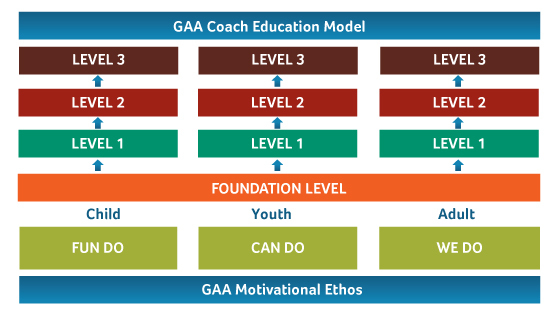 To create a coaching system which produces and supports the development of coaches and players, the GAA has developed a model of Coach Education has been reformatted to take account of the different playing capacities that exist between children (up to 12 years), youths (age 13 â 18) and adults (age 19+), and the competencies that a coach is required to display when working with each of the playing populations. These streams have been identified to cater for the diverse needs of children, of youths and of adults. Quality Coaching â as part of an overall Games Development Plan â promotes fair play, builds social cohesion, self-esteem, and enhances health and well-being as well as supporting social and economic objectives. Coaches should be committed to creating fun, safe playing environments for all of our players, regardless of age or ability level. To safeguard our players, coaches abide by the GAA Code of Conduct, have completed the GAA/ISC Child Protection in Sport Awareness Workshop and are vetted by An Garda SÃ­ochÃ¡na/ Access NI. The GAA Learning Portal has been developed to provide better access to key resources for GAA members and those actively promoting Gaelic Games and is a fantastic resource for Coach Education activities. Register as a site member and access Education Programmes to support your role as Coach, Referee, Administrator or Player. Click here to access the Learning Portal website. The education programme includes 4 coursesâ¦ Foundation, Award 1, Award 2 & Award 3, with the focus on continuing education, so that coaches can improve by means of a series of specifically designed courses, workshops and conferences incorporating internationally recognised principles of best practice. These opportunities will include a combination of theoretical and practical inputs and allow for the use of digital and e-learning techniques. A programme of Applied Lifelong Learning enables coaches to continually develop skills and progress at a rate suited to their own development.